This just landed on the master branch. where you can change the number of worksheets in new document, which becomes effective the next time you create a new document. Very cool. Awesome work people. I wonder if it is worth to consider an inclusion of these tools in LO. The WorksheetMaker used to be quite convenient to manage names and so on of sheets. Hi Hans, Thanks for the URL. If the tools are indeed useful, why not? Though I normally prefer to implement truly useful functionality in the core, not as extensions. cool that you like them. I think it is a pitty that so much cool features for LO/OOo exist without a broad acceptance or spread. Maybe some day we see them in LO. Maybe you can put the link some place in the wiki or so? P.S. : I really have great respect for your and other developers work. Keep up the good work. The Worksheetmaker sound interesting, I will have a look at it. See If I can implement some of that in LO. 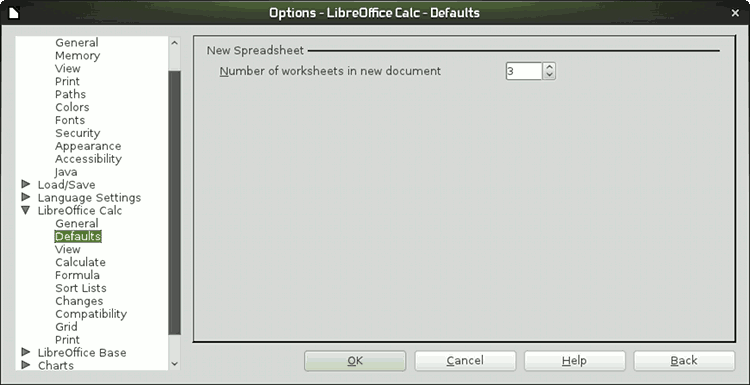 I was myself thining of adding some more options maby to set the the default names of the sheet tabs. or what ever. Just a thought. that would certianly be awsome. The functionality provided by the extension was really good at that time. The default names sound good too. But if you start implementing such things you should try to make it configurable with “templates” (list of names which is loaded …). I do not know how familiar you are with gnumeric. In any case gnumeric has in my opinion the best implementation for worksheet management I know of. Besides an “crazy” option to change row and column numbers on the fly it is also possible to sort worksheets or to label them in a convenient way. Defenetly something to learn from.